Ah, rural life . . . and death. The following was published in my local newspaper on April 25. This has to be the worst-written obituary header ever written. Ever! For obvious reasons I’ve changed the name of the deceased. A momentous event happened in the life of Sally Smith, 99, on Sunday morning, April 19, 2015: she left it. On Sunday my husband left for a two-week trip to our home town, while I remain in Maine. People often ask me if I’m afraid to be alone in such a rural spot. Fortunately the area in which I live is pretty much crime-free. There are people I can call for assistance for other emergencies if necessary. But of course there is always the possibility of an accident. The only time this became a reality was when I fell – – hard! – – on some ice and just quietly lay on my back on the snowy ground looking up at the sky, waiting for the pain to pass and thinking, “This. Is. Not. Good.” I knew I wasn’t badly hurt, but the drama queen in me did force me to consider the possibility that I could die here and no one would know about it! (My husband and I do communicate with one another several times a day, so help would arrive before the vultures start circling.) Fortunately after a few minutes’ rest I was able to get up and go about my business. I do try to avoid unnecessary risks when possible. I always let someone know where I’m going and when I expect to be back when I walk, hike, or kayak alone. My dog usually accompanies me. I wear bright neon colors even when it’s not hunting season so I’m easily visible while walking on the road or kayaking on the lake. And I am well versed in self-defense. I guess I just have the spirit of a free-range kid. But for Monday, with my husband away, I was planning on sleeping in late. Alas, it was not meant to be. I was awakened abruptly at 6:30 a.m. by a horrible, loud vibrating noise. It sounded like a pipe that might be connected to our furnace. The noise came and went, then started up again intermittently. I dragged myself out of bed, praying that the furnace would not blow. It’s times like these that being alone can be challenging. Unlike in my home town, I don’t ever feel unsafe here in rural Maine, but it’s a hard realization that you can’t rely on someone else to solve your problems for you. You need to stay calm, and think things through, which is sometimes easier said than done. Mainers are great diagnosticians and good repairmen, but I didn’t want to call my heating person only to find out it wasn’t the furnace – – I didn’t want the story of that “dumb lady from away” to make the rounds of the local diner that would make me a laughingstock and recipient of quiet smirks the next time I went into town. So I was determined to get to the bottom of the mysterious noise. Even if I couldn’t fix it, I could at least identify it. But when I got to the basement, the noise faded, and I realized the source of the noise was elsewhere. But where? There was no regular pattern to the noise. I kept walking around the house looking for clues. Then I went to the porch. It could be the noise was coming from outside. When I ventured outside, the noise stopped. To be safe, I carefully checked under the porch, and around all four exterior corners. Nothing. But the second I stepped inside, the noise started up again. Now I determined the sound was indeed coming from outside. But it was like a game: when I would go outside, the noise would stop. I’d go inside, and the noise would start up again. Back and forth, in and out, and I wasn’t any closer to solving the mystery. Finally I went outside and stayed outside. Making myself small, I stood silent like a statue, not moving an inch. I waited for the noise to start up again, whenever that might be. And sure enough I wasn’t disappointed: a yellow-bellied sapsucker, which is a type of woodpecker, flew to my roof and promptly began attacking my metal chimney cap! 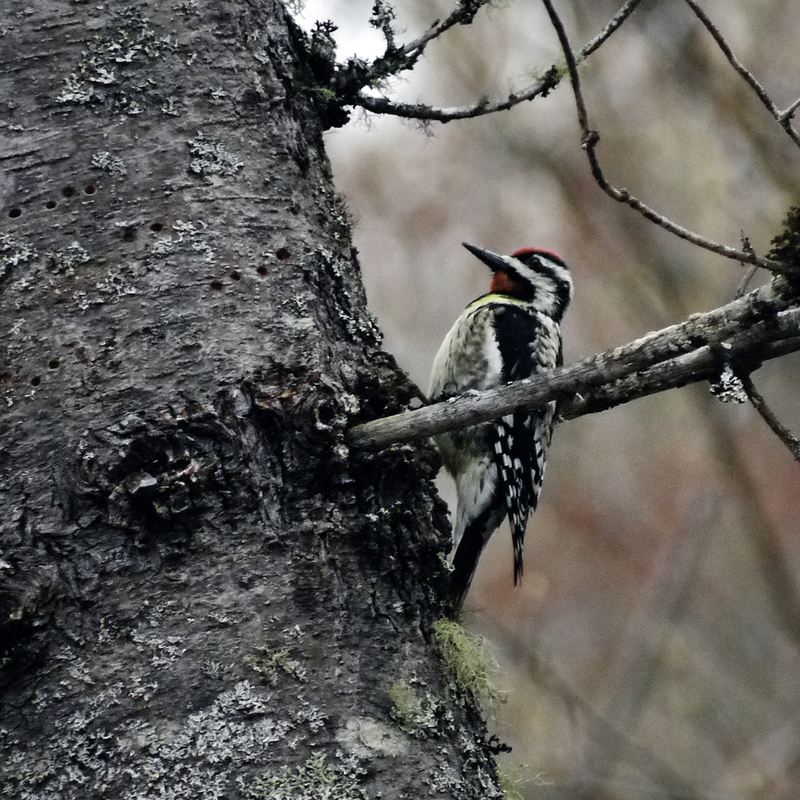 Why a woodpecker would prefer metal to all the juicy, bug-saturated trees surrounding my house remains a mystery. Perhaps it saw the chimney as an alluring location for a future nest. And this bird was no dummy. The minute it would see me, it would fly away, but as soon as I retreated to the shadows it was back, pounding away. The vibration in my house was actually the entire length of the metal chimney reacting to the woodpecker’s pounding outside. Besides the genuine annoyance from the noise, I was concerned about damage to the chimney, which would be an expensive repair. And because I am away for weeks at a time when I visit my family in my home town, I was not going to be able to be on constant woodpecker patrol. But I was here now and I just wanted my peace and quiet. Even though it wasn’t particularly cold outside, I decided to build an early morning fire in the wood stove. I figured the combination of hot metal and spewing smoke from the chimney top would discourage the bird. Fortunately I was right! The woodpecker stayed away the remainder of the day. Alas, the very next morning at 6:30 a.m. the yellow-bellied sapsucker was back, pounding away. Now the outside temperature was even warmer, but once again I lit a fire and I was undisturbed the rest of the day. This morning the bird must have decided it wasn’t worth the effort, and left my chimney – – and me! – – blessedly alone. Considering that outside temperatures are supposed to reach a beautiful 70 degrees next week, I hope I won’t be lighting any more fires in the wood stove to keep the woodpecker away, anytime soon. And tomorrow, I’m sleeping in.